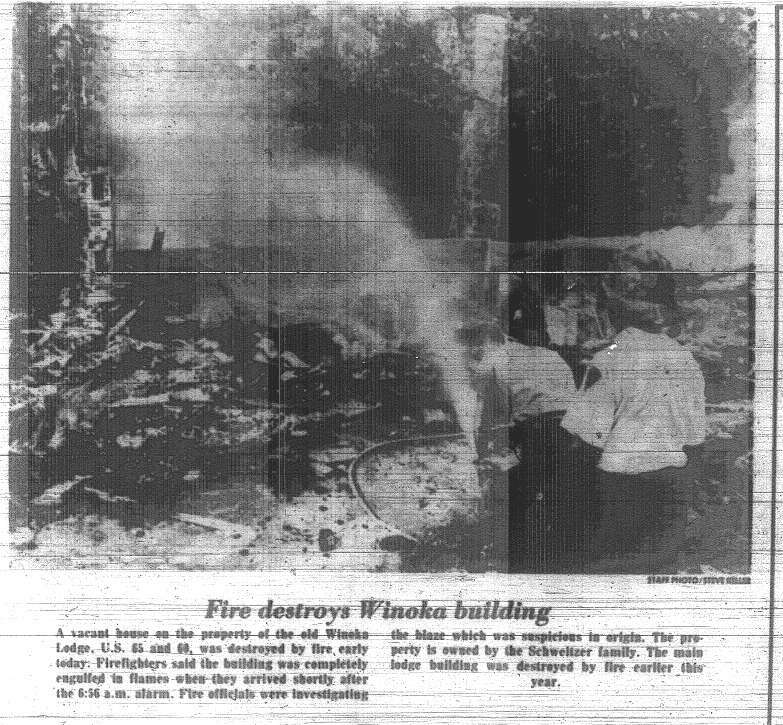 Fire marshals continued their investigation today into a blaze that destroyed the historic Winoka Lodge, an old farmhouse just east of the old Highway 65 bridge, at Lake Springfield. The fire, which may have been a case of arson, inspectors say, was one of three major blazes battled Sunday and early today by city firemen. Cigarettes were blamed as causes for the other two, both at apartment buildings. Concrete steps and a brick fireplace are about all that remains to the house, also known as the old Schweitzer place. The unoccupied, three-story structure was engulfed in flames when Springfield Fire Unit 7 arrived at 2:25 a.m. Sunday. The house and property is jointly owned by Mr. And Mrs. Lee Schweitzer, 2608 Glendale, and Jewell Schweitzer, 2550 South Luster, and Robert Fred Schweitzer, 637 South Fremont. Built about 1890, the structure once served as a hunter’s club. One of the early owners of the property, which originally included 54 acres and 11 springs, was Dr. Edward M. Shepard, who taught biology and geology at Drury College from 1878 to 1908. He sold one-quarter shares to Judge James R. Vaughn, Judge Jeremiah Cravens and Marcellus Holbrook. Cravens and Holbrook later sold their shares to R. W. Stewart and Dr. D. F. Finel. The name Winoka comes from the Osage Indian word for “great spririt,” and flint in the area was used for arrowheads. In later years, an arrowhead motif was followed in improvements and the works from an arrowhead-shaped fountain were donated to Drury. The original property included an island in the James River, which was taken for construction of a highway bridge. The Schweitzer family purchased the property in 1935. It had not been occupied in several years. A pool and bath house are located on the grounds in the immediate vicinity of the house. Such a shame, this was and is a fine piece of river front property located on the upper James near Hwy 65. I have walked it many times and marveled at it’s remaining structures and wondered what it would have been like in it’s heyday.